What Are My Choices In The Electricity Market? 4) A special ComEd power pricing plan called Hourly Pricing. This guide focuses on No. 2, unregulated alternative suppliers. These companies sell their offers in a number of ways: door-to-door, over the phone and through the mail—but also at community events and through friends. We’ve even received reports of suppliers working through churches. WARNING: In the current market, it’s likely the regulated utility–ComEd–or your town’s negotiated power deal is your best bet. Your electric bill is divided into three main sections: delivery, supply and taxes. The “delivery” section is where the utility makes a profit, and covers the costs of maintaining the wires, reading the meter, mailing the bills, and all the other duties relating to administration and infrastructure. You will always pay the regulated utility, ComEd, for delivery; this is how the company makes its money. Also, if there is a power outage or any other problem with your electric service, you will still call ComEd. The “supply” section of the bill covers the cost of the actual power you use. This is the part of your bill that changes if you opt for a different supplier. Traditionally, a utility buys electricity through a process managed by the state-run Illinois Power Agency (IPA), and then uses its wires to deliver that power to your home. The utility is supposed to sell the electricity at the same price it pays, with no markup. Choosing another supplier means that you will pay a different company to buy and supply that power. Although those charges will still appear on your ComEd bill, they are actually being set by that other supplier—and unlike the utility, that supplier’s rates are not regulated or reviewed by the IPA or Illinos Commerce Commision (ICC). • You do not have to pay a cancellation penalty if you cancel a contract within 10 days of the supplier’s charges first appearing on your electric bill. There’s no guarantee. In the current electricity market, it’s likely that the regulated utility is your best bet. So if you are pitched an electricity offer, you need to be careful to ask good questions and read the fine print before signing up. 1) Be careful about people at your door who say they’re from the “electric company” and offer to lower your bill. Don’t give out your account number or electric bill unless you’re sure you want to sign up for an offer. A dishonest sales rep can use your account number to sign you up for an alternative supplier without permission. 2) Find out what the company is charging and how that compares with the utility’s price. Ask whether the supplier rate is a fixed rate, and for how long, or a variable rate that changes monthly. 4) Ask if the plan charges any fees. CUB has seen monthly fees as high as $9 a month. That’s about $100 in costs over a year regardless of using any power. 5) Ask if the company charges an exit fee if you want to leave a plan before the contract is up. What Are Some Myths About Competition? 1) I must sign up with an alternative supplier. False! Signing up is optional. If you’d rather keep ComEd as your supplier, you can. 2) An alternative supplier will protect me from ComEd rate hikes. False! Electric bills are divided into three parts: supply, delivery and taxes. While you might secure a lower supply rate with an alternative supplier, you won’t be protected from delivery rate hikes that ComEd gets before the ICC. Everybody pays those delivery rates, because the utility owns all the wires and will always deliver power to your home. 3) If I’m getting a bill from my utility company, I’m not with an alternative supplier. False! Because ComEd owns all the wires, you will always pay it to deliver power to your home. 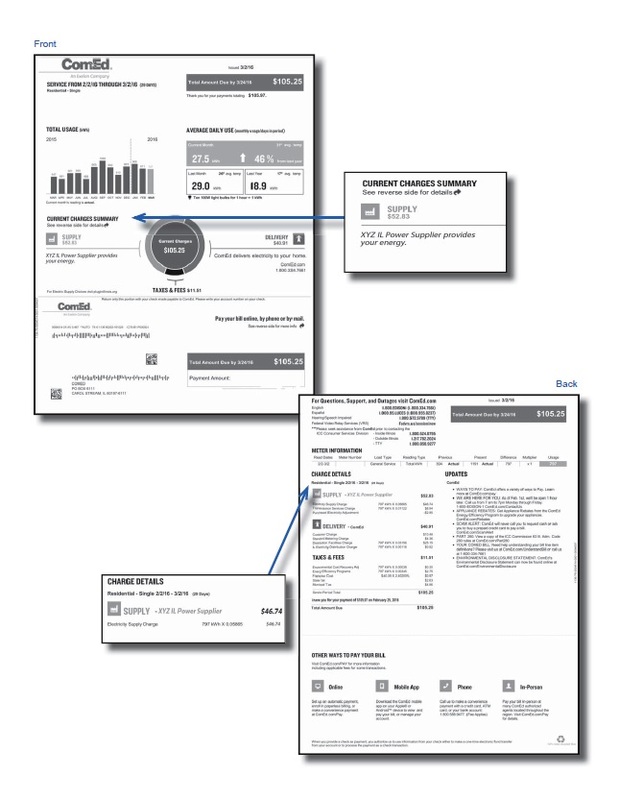 Suppliers include their charges in the supply section of your ComEd bills. Municipal aggregation is when a city, village, town or county negotiates electricity prices with an alternative supplier for its residents. Such community power deals were made possible by an Illinois law passed in 2009. With aggregation, the switch to a supplier is automatic, as long as residents in your community passed a referendum in favor of aggregation and as long as you don’t opt out of participating in the program. The idea behind aggregation is that local leaders can use the collective buying power of a community’s residents to negotiate a good price with a supplier. Will I Save On A Municipal Aggregation Deal? 2) Do I have to pay a monthly fee? What Is A "Green" Plan? Several alternative electric suppliers offer “green power” options. However, even if you purchase “green energy,” it does NOT mean the actual electricity you consume is coming from a renewable energy source, like wind or solar power. This might come as a surprise to some consumers, because of misleading and/or confusing marketing in the industry. When you turn on the TV or charge your cellphone, there’s no easy way to determine if the electricity you’re using is coming from a nuclear plant, wind turbine or any particular power generator. Those electrons are flowing from the power grid, which is constantly being fed by thousands of sources, from the dirtiest coal plant to a home’s rooftop solar panels. If you sign up for a “green plan,” it just means that your chosen supplier is buying “renewable electricity credits,” or RECs, on your behalf. Those RECs represent clean energy that’s being added somewhere to the power grid. For example, if a consumer enrolls in an alternative supplier’s “50 percent green” plan and uses 1,000 kWh of electricity in a month, that customer could claim the environmental benefits of adding 500 kWh of “green” electricity somewhere to the grid. Likewise, if that same customer was on a “100 percent green” plan, that person would offset their entire power usage for that month. Does CUB Support "Green" Plans? CUB supports a customer’s right to sign up for a green plan, but these plans are often more expensive than the utility’s price. Green plans shouldn’t distract from the best ways to help the environment and cut your electric bill: practicing energy efficiency or signing up for special plans that allow you to move your electricity demand to off-peak hours. ComEd’s Hourly Pricing program: Charges a market rate that changes hourly, encouraging customers to put off heavy appliance usage until times of day when power prices are low. While not for everyone, this program has saved people an average of about 15 percent on the supply portion of their power bills. For more details, call ComEd, at 1-888-202-7787, or visit: https://hourlypricing.comed.com. ComEd’s Peak Time Savings program: Gives customers an opportunity to save money without risk. By signing up, consumers are credited on their electric bill when they reduce power usage during designated periods when electricity is most in demand. For more information, call ComEd, at 1-844-852-0347, or visit: www.comed.com/pts. Energy efficiency programs: The cheapest kilowatt-hour is the one you never use. Energy efficiency is the best way to save money, and the utilities offer a whole menu of programs to make your home more efficient and cut your utility bills. For more details, visit CUB’s Energy Efficiency page. Your bill is divided into three parts: supply, delivery and taxes. Supply is what you pay for the actual electricity you use. Delivery covers the charges for getting the power delivered to your home. If you’re with an alternative supplier, it impacts the supply part of your bill. Beware: Even if you’re with an alternative supplier, you will continue to get a bill from your regulated utility. Suppliers include their charges on the supply section of your utility bill. People on a bad deal often tell CUB they had no idea they were with another company until their bill went up. Check your bill each month to see if you’re with an alternative supplier. On your ComEd bill: If you’re with another supplier, its name should be in the “Supply” section of your bill, on pages 1 and 2. On page 2, you should be able to see the per kilowatt-hour price you’re paying. If you don’t like the supplier’s response, file a complaint with CUB, 1-800-669-5556.